Essense Designs, style d2342: French lace captivates under embroidered lace, with sculpting at the waist. A dramatic train and halter neckline add drama from start to finish. Celebrate lace in this contemporary, fashion forward design from Essense of Australia. Available colors: Ivory/Ivory Tulle Illusion, Ivory/Java Tulle Illusion, Ivory/ Porcelain Illusion, White/Java Tulle Illusion, White/Porcelain Tulle Illusion, White/White Tulle Illusion. Loving lace doesn’t mean looking like you’re revealing your inner Grandma at your wedding. Today’s bridal designers have experimented with this ancient fabric style to produce some gorgeous new ways to use it. White lace has traditionally been the wedding choice, however, in recent years a variety of expressive shades have taken the spotlight. New York Bride & Groom of Raleigh has an exceptional array of new, lace inspired styles to make you fall in love all over again. Watters by Wtoo, style Catherine: This glamorous sweetheart gown offers eye-catching lacy detailing within the bodice, providing a delightful contrast with the flowing skirt. Available sizes: 00-32W. Available colors: Shown in Rosegold, available in a variety of shades. NYB&G Raleigh offers numerous wedding dress and bridesmaid gown options for lace lovers in the Triangle and beyond. Enjoy the endless possibilities that come from incorporating a little lace all the way to embellishing the entire gown with it. There is an elegant magic to the material that is perfect for every style and taste. If you are yearning for a timeless wedding style, look no further. Allure Bridals, style 9377: This lacy sheath wedding dress offers exceptional detailing and artistic intricacy. 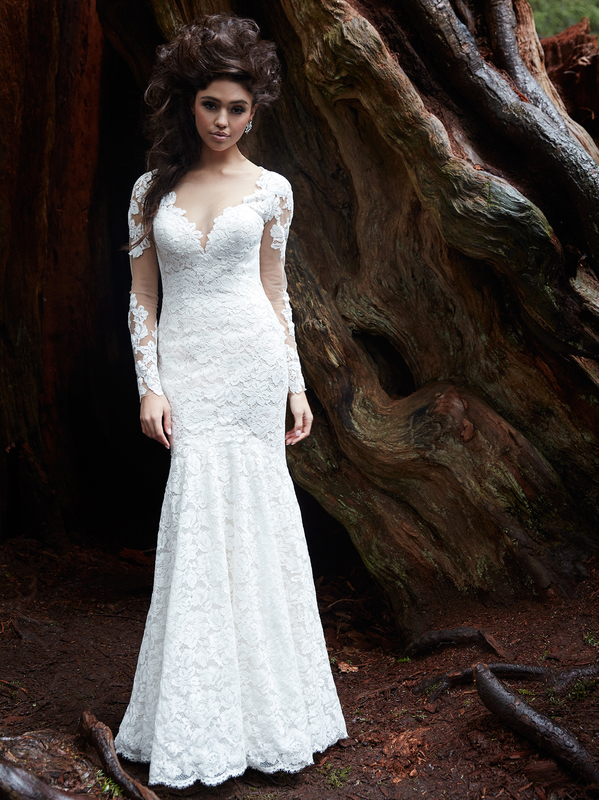 The illusion neckline and ethereal sleeves add up to a sweet style with ultimate elegance. Available sizes: 2-32. Available colors: Ivory/Gold and Ivory. Which Lace Do You Love? Chantilly or Galloon Lace: Possibly the best known type of lace is very fine and delicate and is made on a lightweight hexagonal mesh background. The motifs are sometimes outlined in a heavier silky thread or exhibit shading effects. Chantilly laces normally have doubles scalloped edges. Kate Middelton’s royal wedding dress was made of a type of Chantilly lace. Beaded Lace:Especially popular in the last 12 months, the type of lace is embellished with beads, crystals and sequins to produce a slightly antique look. They often have a scalloped edge.